If you didn’t get the Juicy Couture Limited Edition “Gingerbread Man” Charm for Christmas, don’t be sad because you can get it for yourself and it’s on SALE! 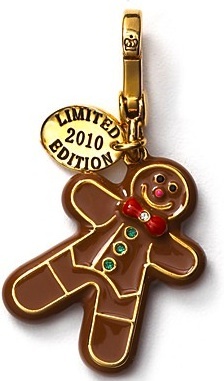 Bloomingdales has the Juicy Couture Limited Edition ” 2010 Gingerbread Man” Charm and yes, lots of other charms too but they are almost all on sale and prices are great. Many of collect the Juicy Couture charms so hurry on over to the Bloomingdales’s website and grab that cup of coffee or hot cocoa and start shopping!